A partial skeleton has been found near Cardiff that is thought to represent a new species of basal neotheropod from around 200Ma. The find was analysed by a team led by Dr David Martill and includes around 40% of the skeleton. The results are published in Plos ONE. 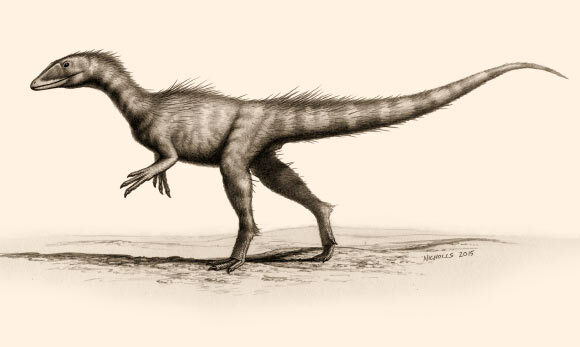 The authors proposed the name Dracoraptor hanigani, honouring the finders Nick and Rob Hanigan. Dracoraptor hanigani was a small, agile carnivore, about 2.3 feet (70 cm) tall and 6.5 feet (2 m) long, with a long tail. The find represents perhaps the first theropod to be discovered in the early Jurassic in the UK. Its also the most complete theropod dinosaur from Wales and the first dinosaur skeleton from the Jurassic of Wales.